Half the fun of asking the most radiant soprano you know to sing “Ave Maria” at your wedding is to hear her stifle her ego and submit to the humility and purity of the music. 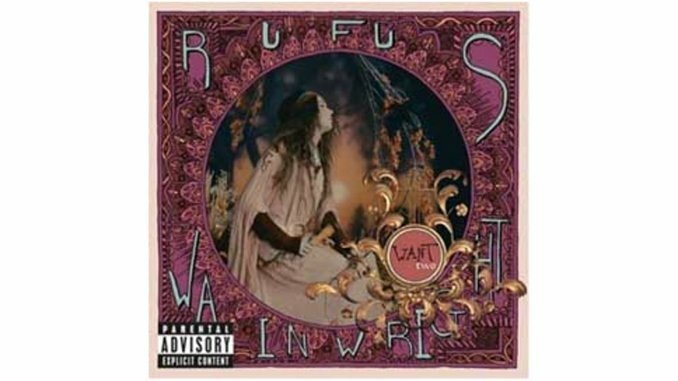 Nothing like that happens when Rufus Wainwright launches into his “Agnus Dei,” an epically reverbed proclamation that turns a simple plea for peace into an assault on the spotlight, establishing the bravado indulgence of this diva turn. The arrangements shine, even when they’re merely ornamental—the harpischord and powdered-wig act of “Little Sister” being the cutest—and practically every song sounds refined and cultured: the music isn’t bizarre so much as adventurous. But not every risk pays off. The kookiest lyrics wind up in the best songs, like “Old Whore’s Diet,” a Baz Luhrmann-sized finale propelled by fat-bellied Middle Eastern beats. And Wainwright can still work a ballad, as on “Peach Trees,” where he all but drools the chorus. But the sweetest, most sentimental songs often let their melodic potential spill over the sides, and it’s hard to listen to the sharp hook of “Memphis Skyline,” only to hear it evaporate into a saccharine mist at the end. Wainwright’s wit also fails him: jokes about what kind of head a gay John the Baptist would give fall hopelessly flat after one listen. More disappointing, the constantly changing set pieces ultimately highlight Wainwright’s limits as much as his strengths. Where Want One emphasized his ability to soar, Want Two drowns him in costumes; his range actually sounds restricted when you hear the same droopy-lidded croon against such varying backdrops. The cover art may portray him swooning, but the only cut betraying nearly that much emotion is “The Art Teacher,” a ballad Wainwright sings as a woman who never recovered from a girlhood crush; her first love haunts her drab adult life. The song’s melodrama draws out the most feeling and vulnerability from his vocals, and it comes the closest to achieving the longing promised by the album’s title.